Brighton Festival is delighted to announce that the theme for the 2019 Children’s Parade, which will take place on Sat 4 May, is Folk Tales from around the world. Taking over the streets of Brighton will be folk tales from Africa, Europe, the Arctic, the Americas, Asia and Oceania, including the likes of Danish folk tale Fat Cat, How the Zebra Got His Stripes (Namibia), The Little Mermaid, The Fox in the Moon (Peru) and Alaskan tale The Salmon Princess. 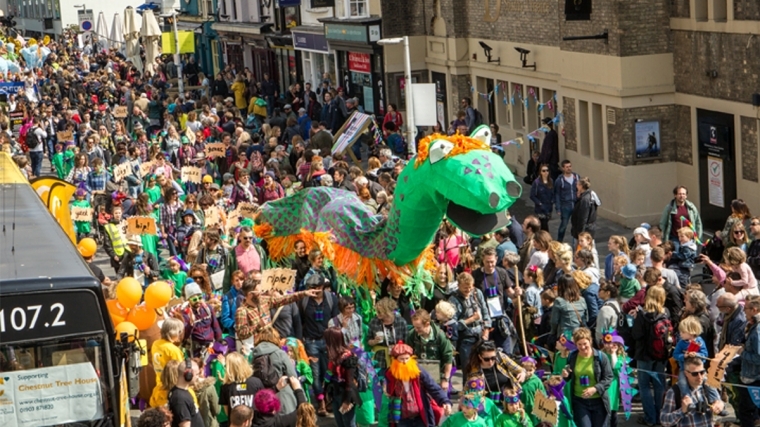 Jointly produced with award-winning community arts organisation Same Sky and sponsored by the University of Brighton for the second year, the annual Children’s Parade will take place on Saturday 4 May 2019 to officially launch the Festival. The largest of its kind in Europe, the free event takes place in central Brighton and has delighted participants and spectators for nearly 30 years. With a different imaginative theme each year, previous parades have seen children dress up as paintings, letters of the alphabet, woodland creatures and street names. Schools from across the region will be allocated a folk tale from a selection, chosen to reflect the diversity of artists taking part in the Festival. The stories will be studied and explored by teachers and pupils before being presented in costume, music and carnival structures by around 5,000 school children and community groups. This year, the theme is inspired by Brighton Festival Guest Director, Malian singer, songwriter and multi-instrumentalist Rokia Traoré. With her work rooted in the Malian musical tradition, Traoré will present the UK premiere of Dream Mandé Djata, a musical monologue based on West African oral history storytelling. The Parade will be led by Rokia alongside schools representing folk tales originating from West Africa. One of the most spectacular community events in the UK, Same Sky spend months working behind the scenes to create the Children’s Parade. Artists collaborate with teachers to make magnificent effigies, choreograph dance routines and compose parade chants, with free masterclasses to develop design ideas and encourage imagination to flow.